More people are moving from the Nashville area to Chattanooga than any other city, followed by Atlanta; Knoxville; Dalton, Ga.; and Cleveland, Tenn., according to a new study. The report by Chattanooga-based mover Bellhops, which covers 2011-2015, shows people from Nashville and Atlanta see the Scenic City as "a mix of big-city life and hometown appeal," said Kyle Miller, the company's communications director. "People [from Dalton and Cleveland] are looking for a metropolitan feel," he said. The results come as metro Chattanooga grew by 4.2 percent, or 22,404 people, from 2010 to 2016, according to Bellhops. While the growth is solid, Nashville grew at an 11.6 percent rate and Atlanta at 9.2 percent. Birmingham grew at a 1.6 percent rate, U.S. Census Bureau figures show. 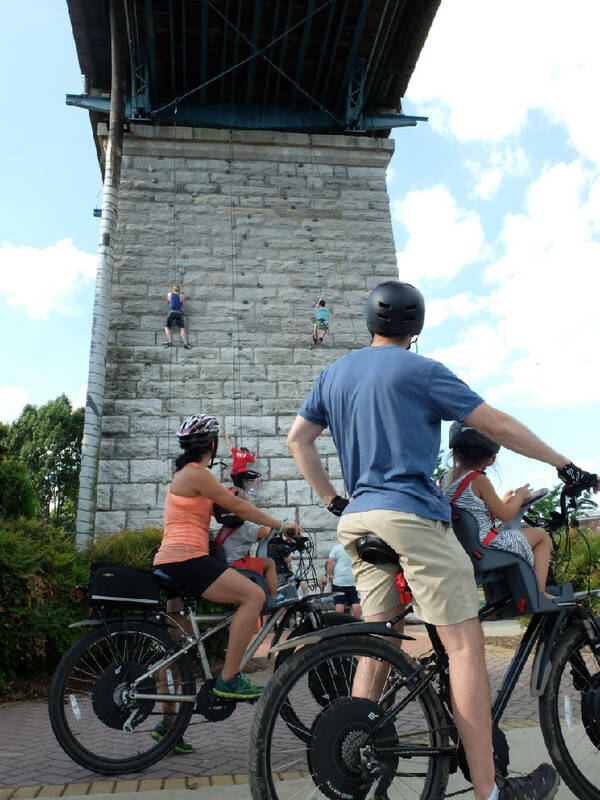 Staff file photo by Tim Barber A family stops their electric bicycles to watch area residents scale the climbing wall under the Walnut Street Bridge. Chattanooga's outdoor attractions are seen as helping woo people to the area. For Bellhops, the study will help the company as it weighs whether to add moves from one city to another, Miller said. Bellhops now is a local moving company only and currently located in 16 metro areas, he said. "It gives us the opportunity to possibly do regional moves or intrastate moves," Miller said of the company that employs 80 people at its headquarters but up to 2,000 movers at peak periods. The study showed 1,898 people moved from metro Nashville to the Chattanooga area in 2011 to 2015. The net migration, which is minus those going the opposite direction, was an increase of 748 people shifting to Chattanooga, results indicated. Chattanooga's net gain of Atlanta area residents was even a little larger, 806, even though the total migration to the Scenic City was fewer at 1,779 people, according to the Bellhops and Lawnstarter study. Lawnstarter connects people to lawn care providers. Charles Wood, the Chattanooga Area Chamber of Commerce's vice president for economic development, said the city is on the rise for a lot of reasons. "My experience is that this city wants you to be successful," he said. "You don't find that everywhere." Wood said there's a willingness in Chattanooga to help people from another community. He called that attribute "a huge factor in grabbing great folks and having people move here." Also, Wood said, Chattanooga combines lower cost with quality of life. "You can buy a house in Chattanooga for a lot less than other places," he said. In the top 10 cities sending residents to Chattanooga, a couple of metro areas surprised Miller. For example, the San Antonio area came in at No. 7, while Detroit was No. 10. Miller said he assumed the Detroit figure was due to Chattanooga's growing presence in the auto industry. Chattanooga's Volkswagen assembly plant is on the upswing with the addition of production of the Atlas sport utility vehicle, which went on sale last year. Also, the automotive supplier base has grown in the area. But Miller said he didn't know why San Antonio would show up. Wood said Chattanooga's outdoor attractions, such as mountain biking or climbing, are a draw for people and maybe a lifestyle more familiar with those who live in the West. But, he added, it's one that's also attractive for people who live in Nashville and Atlanta.